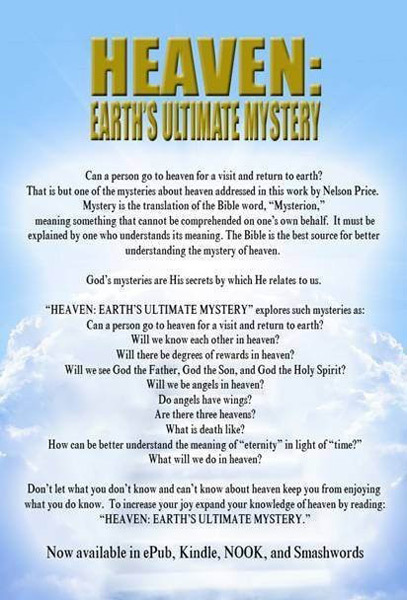 The Christian Index typically does not review eBooks, but we are making a rare exception by reviewing Nelson Price’s new book Heaven: Earth’s Ultimate Mystery. The book is vintage Nelson Price who writes as eloquently as he preaches. Price contends that, “heaven is a encapsulated in an enigma encased in a conundrum.” However, like a theological Sherlock Holmes he uncovers the seemingly hidden truths about heaven and presents the reader with multiple invaluable insights. The author basically poses twelve questions and proceeds to provide practical, biblical answers to each query. The questions he addresses include: Are there different rewards in heaven? Is there time in eternity? Who is the Jesus we will meet? Will we see God the Father and the Trinity? And can a person go to heaven and return? I have preached multiple sermons on heaven and studied the subject at great length, but Price has opened up new vistas of truth on the subject that thrill my heart. For example, regarding the question, “Is there time in eternity?” the venerable author goes down deep, stays down long, but does not come up dry. In fact, his response to the question is fascinating and revealing. This book on heaven speaks of the rewards the saints will receive in glory, but the author does not leave out the judgment that awaits the unbelievers. Quoting the ancient Greek philosopher, Epicurus, Price writes, “What men fear is not that death is annihilation, but that it is not.” He states that for many the fear of death is chiefly the fear of judgment. That is precisely what heaven is to the one who has committed his/her life to Christ. With the current interest shown in heaven this work seeks to answer some of the many questions about heaven. If you elect to read it I pray it will be informative and inspirational. Please consider using your media sources, such a Facebook, Twitter, and the Internet to share this announcement with friends. Check out the book cover below. It is available on Kindle. © 2014 Dr. Nelson L. Price All rights reserved.